Microsoft has released an update for the mobile version of Edge that incorporates warnings from third-party fact-checking organization NewsGuard, notifying users about news sites known for poor standards of accuracy and accountability. The feature is disabled by default, but can be activated through the browser's settings menu. When a user visits a site deemed dubious, they will see a red icon in the address bar, which they can click to see what NewsGuard calls a "full nutritional label". This is a checklist of factors including whether the site repeatedly publishes false content, clearly separates fact and opinion, regularly publishes updates and corrections, and labels advertisements appropriately. “Microsoft is partnering with NewsGuard to offer the NewsGuard browser extension on Microsoft Edge, and a feature in Microsoft Edge mobile apps for iOS and Android to help our customers evaluate news sources," said a spokesperson for Microsoft. "Across both the browser and the apps, NewsGuard is optional and customers need to take action if they want to use the feature." 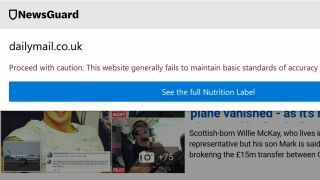 Interestingly, although MailOnline (the website of British newspaper the Daily Mail) is among the websites flagged as problematic by NewsGuard, it remains one of the preset bookmarks on Edge users' homepages in the UK. We've reached out to Microsoft for comment, and will update this article when we receive a response. MailOnline told the Guardian that it would be contesting the label. "We have only very recently become aware of the NewsGuard start-up and are in discussions with them to have this egregiously erroneous classification resolved as soon as possible," said a representative.